Many people are talking about a prediction for a large earthquake to hit North America this week, from a geologist who allegedly predicted the 1989 Loma Prieta quake, Jim Berkland. I can't comment on the 1989 story, as I am having trouble finding details about it from reputable sources, but here are some thoughts about the widely-viewed recent Fox News interview in which he makes his current prediction. Mr. Berkland makes several points in the interview about beaching of whales, etc., that may or may not be valid. I am not in a position of expertise that allows me to judge. They are certainly interesting, but aren't much on which to base a geographical location. Similarly, it is true that some large quakes have occurred near the full moon, and it is also true that some large quakes have occurred closer to the new moon than to the full moon (like the 9.0 Japan quake, 6 days after new moon and 8 days before full moon). 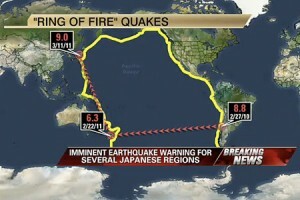 The interview gives the impression that there has been a clockwise progression of major quakes around the "Ring of Fire," the seismically active zone surrounding the Pacific. The graphics showed recent notable quakes in Chile (8.8 last year), New Zealand (6.3 last month), and Japan (9.0 last week), and implied that if one continues the clockwise progression, one ends up at North America. First, while the 6.3 New Zealand quake did considerable damage, the real seismic event was the 7.0 earthquake several months earlier; so let's say we are talking about a 7.0 in this progression. Still, earthquakes around magnitude 6-7 happen quite frequently. What made the New Zealand quakes notable was that they took place close enough to population centers to have caused damage. In fact, in 2010 alone, twelve earthquakes occurred over magnitude 6, including three >7 Ring-of-Fire earthquakes on the same day in the Philippines and one in Sumatra...and a 7.2 in Baja California and a 6.5 off the shore of Northern California (we didn't hear about the latter because it didn't affect us here). The 6.5 occurred 1.5 months before the massive Chile quake, and the 7.2 occurred a month after the Chile quake. Therefore, trying to demonstrate a clockwise pattern of earthquakes based on Chile, New Zealand, and Japan strikes me as trying to see a pattern by ignoring most of the data. To be fair to Mr. Berkland, he never said in the interview that this clockwise progression including New Zealand pinpointed North America to be next; that was the Fox News graphics playing while Mr. Berkland spoke. Still, that aspect, had it been accurate, would have been the most compelling part to me. So is Mr. Berkland wrong about a large quake hitting North America this week? I couldn't say. Perhaps his other information is solid. In any event, if no large quake occurs here this week, he won't have been wrong; he said only that there's an increased chance of one. And so should you be prepared for a sizeable earthquake if you live in an earthquake zone? Of course! Whether or not it is a result of this week's prediction is less important. Hi, Matt. This is Yayoi. Nice job!